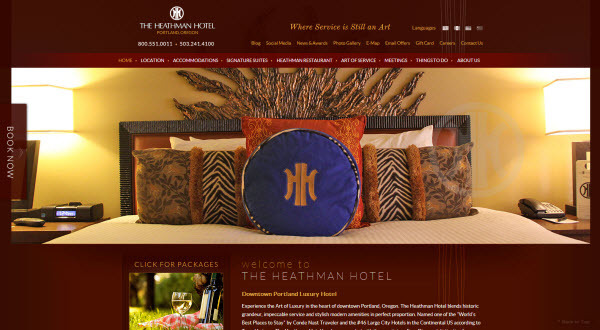 The Heathman Hotel in Portland is a luxurious property located in downtown Portland, Oregon. With the many changes in search algorithm in 2012, Milestone had to revamp the property’s website to continue its exceptional web performance and ensure search crawlability. In addition, Milestone has implemented several strategies such as social media optimization, mobile site, etc. to further enhance the hotel’s web performance. 2) Mobile website – developed to tend to the growing population of travelers that use mobile devices to search for and book hotel rooms. 3) Strategic online marketing – comprises of promoting the hotel’s website on multiple online channels such as major and local search engines, directories, yellow pages, and local citation channels. Blog and News & Awards module – The continuous posts of events, things to do, etc. on the hotel’s blog, as well as publishing news on a regular basis, enhances the site’s freshness score, which is a key search engine ranking factor. Social media feed page drives engagement, which again is a key factor to search ranking.